iPad charging, check. iPhone charging, check. Kindle charging, check. MP3 player charging, check. Location, all over my house equaling cords everywhere. Admittedly I am a neat freak. Before I go to bed, I clean my house, put away any dishes and plug in any of my tech tools that need a charge before the next busy day. As my list of tech tools has grown, so has the location they are plugged in around my house: my kitchen, bedroom dining room and living room. To some, this won’t be a big deal, but add another person and their tech tools into the mix and you have cords everywhere. My solution to this was simple: I needed a charging station. I needed to organize my cords. A quick search online pulled up many options. But, I also needed to factor in that I also wanted one that was aesthetically pleasing and wouldn’t stand out in my house. 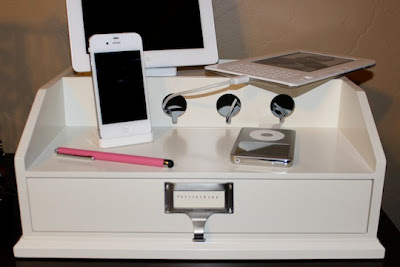 I ended up choosing the Bedford Smart Technology Large Recharge Station from Pottery Barn. Beautiful. The charging station is 12” wide, 12” deep and 6” high, which isn’t small but it fits comfortably on one section of my dresser in my bedroom, next to a 32” flat screen. My favorite feature is the built in power strip plug-in with 6 plugs available. This was a must-have for me, since many (like a similar and cheaper one from Wal-Mart) seemed not to come with it. The four holes allow cords and wires to be hidden but conveniently placed for easy-access to charging. The charging station also features a pull-out drawer, where I keep my flash drives and extra iPhone covers. wow. im impressed cuz im a kind of messy girl and the codes and plugs are everywhere in my room. I was in the same boat-cords everywhere (I'm also a messy girl lol). Glad to help!